Posterior cervical fusion is a surgical procedure performed to stabilize the cervical spine and to relieve pain in the uppermost region of the back. 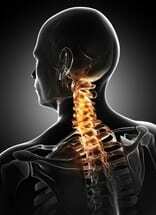 The cervical spine begins at the base of the skull and consists of seven vertebrae with discs between them. One of the most important parts of the body, the neck is also the most articulate portion of the spine, moving more freely and in more directions than the other sections. Beyond that, the cervical spine is also responsible for protecting the spinal cord and providing support to the skull, which in turn protects the brain. Because of the neck's vital functions, injury or disease of the cervical spine is a very serious condition. Once the surgeon is able to locate the targeted region of the spine, any damaged tissue, whether degenerated disc material, bone spurs or other debris, is removed. At this point, the surgeon attaches a bone graft, obtained either from the patient's pelvis or from a donor bone bank, to each of the affected vertebrae, allowing them to grow together over time. In some cases, a synthetic bone graft made of morphogenetic protein, may be used instead of actual bone. The morphogenetic protein has the added advantage of actually stimulating bone growth. In most cases, the use of instrumentation is necessary during a posterior cervical fusion surgery. This typically involves the implantation of metal rods and screws to maintain the bones' positions as they fuse. Once the surgeon is finished, the incision is stitched closed. In most cases, a rigid collar is placed around the patient's neck for spinal support during recovery. Typically, after the posterior cervical fusion surgery is complete, a hospital stay of 1 to 3 days is required. Full recovery, however, may take between 4 and 5 weeks and during this time the patient's activities are restricted. A program of physical therapy is normally recommended to promote a more successful recovery and to achieve maximum postsurgical mobility.